Rupert’s Educational Program participants, joined by two of our current residents (Matthew Rana and Matthew Shannon), took their first field trip of the year to Žemaitija region in the northwest of Lithuania. The itinerary was organised by the Lithuanian artists Antanas Gerlikas and Juozas Laivys. They took us to people and sites that represent art production outside of the capital, both professional and amateur. 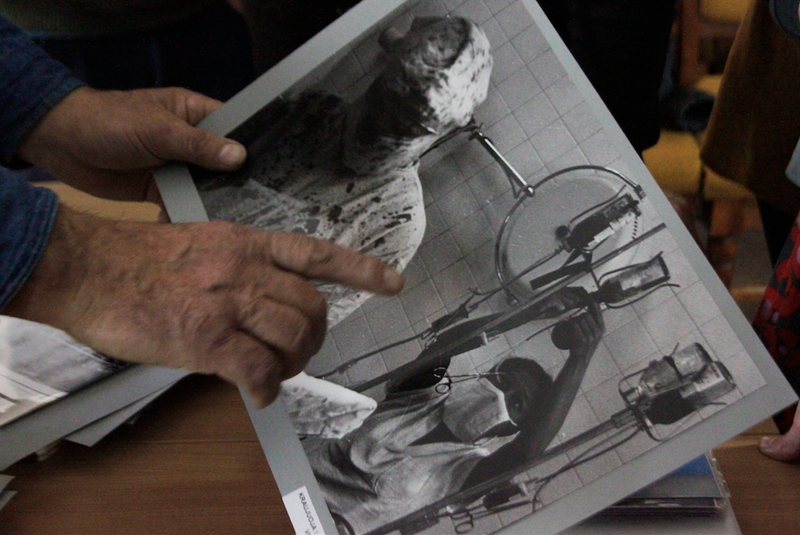 We were led along Plungė kultūros centras’ corridors to meet Stasys Adomavičius, a retired anaesthetist and practicing photographer. Throughout his years in the operating theatre, he had perfected the art of administering ether and documenting the gleaming incisions, sputtering arteries, and urgent dexterity of surgery during the decades spanning the 1950s onwards. Assembled with Stasys Adomavičius were dedicants of Plungė’s arts scene: Tomas Danilevičius, the man behind the regeneration of a disused Soviet water tower into a project and performance centre for the area, and Reda Aurylaitė, representative of the biennial performance festival. Juozas – who is based in Žemaitija – took us through his series of mobile sculptures that have toured Lithuania in recent years. We ate lunch at a local diner. The meals were a generous melange of delicious fried meat and fresh vegetables; nigh impossible to finish but, damn it, we tried. After lunch, Antanas and Juozas distracted us took us to the local zoo where we threw chunks of bread into the mouths of peacocks, goats, a domineering hog and everyone’s favourite llama – the only animal I’ve encountered with three lips. Two sculpture parks then formed the bulk of our afternoon: the first, Orvydai homestead, a collection of religious carvings and assemblages gathering moss. We clambered over and around the monuments along the path, and entered into the former studio of Vilius Orvidas, the sculptor responsible for the hundreds of openair artworks carved in defiance of Soviet anti-religion regulations. Thereafter, we wandered through the Museum of Rare Stones, a collection of more than 150 000 rocks that originally found their way to Lithuania during the ice age. During the 1960s, an aesthetically-minded doctor arranged the rocks for viewing, categorised country-by-country. The rare stones sit in a layout inspired by nature but, much like the Land Art the park’s construction was unknowingly contemporary with, now manages to feel more artificial than the hand-hewn monoliths we had seen just before in Orvydai. Before the road back to Vilnius, Klaipėda’s sea air gave breath to some final utterances of a day that had somehow warped the hours to feel like a week had passed. And with that we look forward to our upcoming trip to Panemunė Castle with artists and writers Julijonas Urbonas and Kristupas Sabolius.